What are the benefits of Pineapples? Why are Pineapples a Superfood? Since pineapples are rich in vitamin C, it can fight off viruses that cause cough and colds. Even when you are already infected with such ailment, pineapples can help you. 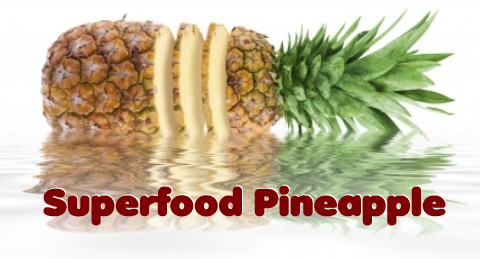 These fruits have bromelain, which is effective in suppressing coughs and loosening mucus. Eating pineapples while taking the right medications prescribed by the doctor for your sickness can help you recover more quickly. Pineapples are also popular for their ability to build and maintain strong bones. This is because these fruits contain manganese, which is a trace mineral that your body needs to build bones and connective tissues. In fact, if you consume a cup of pineapple, you can already get 73 percent of your total body requirement for manganese. People are always very concerned with their teeth that they sometimes fail to give importance to the gums, which are equally essential since they hold the teeth in place. If a person has unhealthy gums, his/her teeth would be in bad condition, and eventually will fall out. Eating pineapple will strengthen your gums that will help keep your teeth healthy and strong. Pineapples are known to prevent different kinds of ailments. One example is macular degeneration. This disease, which is the primary cause of vision loss in adults, is caused by damage to the retina. Reading, recognizing faces, and doing daily activities can become a lot more difficult because of this problem. Including pineapple in your diet can lower risk of this disease by as much as 36 percent. This is because this fruit contains beta carotene that is good for our sense of sight. Since these fruits have anti-inflammatory qualities, eating pineapples can greatly alleviate the pain of arthritis while at the same time improve the condition by strengthening the bones. Apart from arthritis, it can also improve other similar conditions like carpal tunnel syndrome and gout. Bromelain found in pineapples work to neutralize fluids to ensure that they are not too acidic. It also helps regulate the secretions in the pancreas to aid in digestion. Apart from that, since bromelain has protein-digesting properties, it can keep the digestive track healthy.